Mastering illusion. Welcome to the monumental and collaborative art of scene painting. 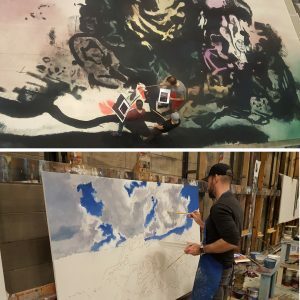 This hands-on rigorous course is designed to develop the visual and manual skills of drawing, painting, and finishes for film, live design, and themed attraction. Students will dive deeply into independent inquiry projects and work in teams producing elements for the UT Department of Theatre & Dance, Center for Arts Entertainment and Technology, and Butler School of Music productions. Mastering the language of visual communication empowers student artists, story-tellers, influencers, entrepreneurs, designers, and place-makers. Mastery and play are at the heart of this course. Warning-you will be challenged and you will get messy.